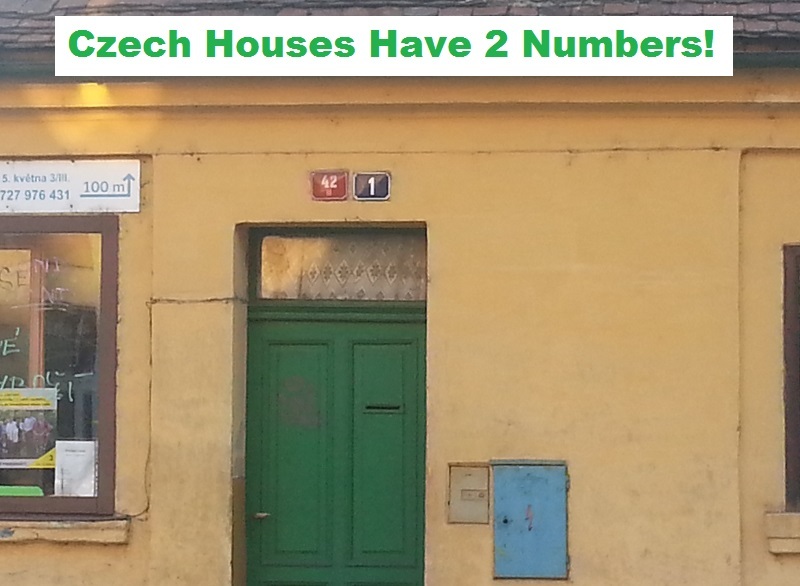 Czech houses have two numbers! I never realized this until last week when I went to the travel clinic to get immunized against Hepatitis A.
Google maps doesn’t work well on my phone so when I arrived in Prague on the day of my appointment I picked up a map from the tourist office. While I was there I showed the lady the address of the travel clinic and asked her to mark it on the map. She went one better than that by using her pen to mark the route from the tourist office to the travel clinic. When I arrived at the street where I needed to be, I used my phone to visit the travel clinic website and take a closer look at the address. That’s when I began to get confused. Although some of the houses in the street had no numbers at all, many of them did and instead of one they had two. In most cases, the numbers were affixed to the wall, directly above the door, on two little, square plates. One of the plates was red, the other was blue. There was a big difference between the numbers as well. I had no idea if I should be walking further down the street or doubling back. In a situation like this, there was only one thing I could do. I glanced in both directions, chose the most attractive girl I could see, and asked her for help. Fortunately, she spoke English. When I showed her the address, she said I needed to look at the blue numbers and continue walking down the street. She was extremely helpful and didn’t seem to mind that I’d stopped her in the street so I took a deep breath and asked her the million dollar question: “Why do Czech houses have two numbers?” She didn’t know. The mystery deepened. When I returned home after having successfully found the travel clinic and received my injection, I went online. The Czech girl hadn’t been able to enlighten me, maybe Google could. I posed my question again: “Why do Czech houses have two numbers?” I had to visit a few sites before I finally got to the bottom of things, but I got there in the end. The blue numbers on Czech houses are, indeed, the street address. The red number plates show the land registry number. In Czech its known as the číslo popisné (descriptive number). The descriptive number is unique. It’s not shared by any other building in the area, but most streets are like to have a no “1” and a no 9″, etc. I’ve never encountered an address system like this before, but my research suggests it’s not unique to the Czech Republic. If there is something I have missed or you have relevant information to add, please feel free to share your knowledge in the comments section below.